a good feeling about her in my gut coupled with a sense of total desperation about finding a sitter. When we lived in Brooklyn, until Zoe was a year old, I had enough family around to watch her when I worked. When we first moved to Montclair–I was working three days a week then–I was fortunate enough to find a sitter—a cousin of a friend’s sitter—who came once a week. My mother came out another day and my husband was home when I worked Saturdays. Then that sitter left me to become a crossing guard, explaining she needed five full days of work. I needed help quickly. Someone who could work two long days a week but didn’t need five, who could manage a newborn and a highly opinionated preschooler, who could read with inflection (that was a must for me, since I had strict TV limits), who played games and could run around after Zoe with ease. I found someone quickly, though it would turn out to be a dead end. Candy was the daughter of a friend’s babysitter, twenty years old, with a one year old son–but assured me she had plenty of childcare for him. I had misgivings about her age, but my daughter loved her and the girl seemed to have a lot of family support around town. I hired her on a trial basis, and everything worked out well for about a week. Then, five days before I was supposed to start working, Candy informed me that she couldn’t come anymore because her own childcare had fallen through. I barely looked at Monique, because I’d been up all night and had interviewed three sitters already that day. I was also nursing every two hours and coping with a jealous two-year-old who thought it was high time we sent the baby back to the hospital where it came from. I said to Monique, “Look, why don’t you come back Monday?” Meaning–but not communicating well enough to convey–that I’d interview her Monday. Instead, Monique thought I’d hired her. She arrived Monday ready to work. I said we’d try it for a day, since I’d be home. But I stressed that I needed, above all things, for her to win over Zoe. Well, Monique did it. She was bright and energetic and attentive. In no time she had my daughter giggling, asking for another story. (Yes, Monique read with inflection.) 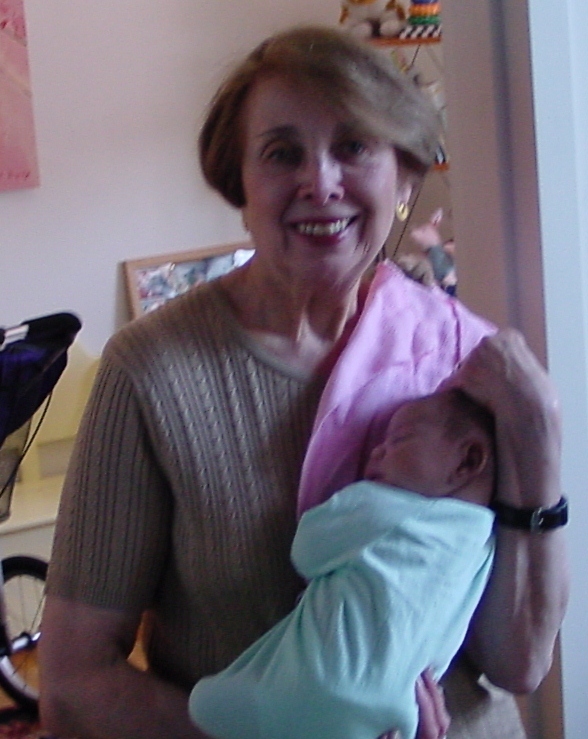 She was also wonderful with baby Theo, with whom she fell in love immediately. It was a happy story. Monique wound up caring for my children, two days a week (the other three, she cared for the children of a friend) from eight until eight, for six years. She stopped only when I went on my hiatus to write. Monique still sits for my kids sometimes, still does my daughter’s hair if ever I need it braided (like we did for sleep-away camp). I consider her a big part of my childrens’ early years, a wonderful influence, someone we care for, who cares for our children. I was lucky, so lucky to have met her, and so were my kids. The most important thing you do as a working mom–responsible for finding responsible childcare–once you have chosen that special person who will make your complicated life at all possible–is take a huge leap of faith . Every day that you leave your children, you must make a choice to trust this person whom you’d never have met if you hadn’t been looking for childcare. This is a truth between nannies* and moms: if not for the children, if not for the mutual need for work—their lives would likely have never intersected. Nannies and moms tend to differ in childcare style, culture, class, education level, and also frequently race. With all those differences, not to mention the odd check-and-balance of power (Mom has the money; Nanny has the kids), there is much room for tension and even conflict. In such a complicated relationship, trust is paramount. And I mean Trust as a two way street. Mom trusts that her children will be safe and cared for and (best case scenario) truly loved by the nanny. Nanny trusts that she will be compensated for hours worked, warned if those hours are going to be drastically increased or cut, respected, treated like a valued human being and not taken advantage of. Trust, respect, balance. Only when all that’s in place can a mother breathe easily and finally begin to relax into the rhythm of her life. A news story breaks, horrifying and gruesome. 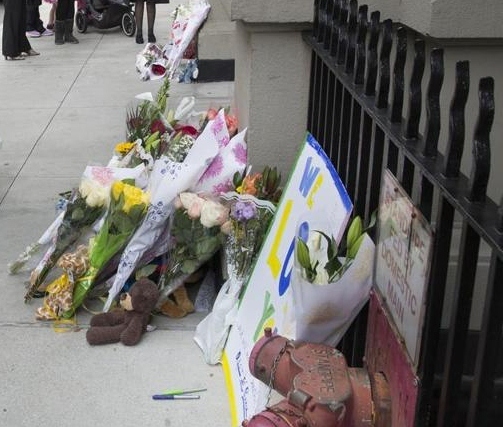 About a nanny on the Upper West Side of Manhattan who was found, her own throat slit, apparently by her own hand (which still held the blade) and the two small children left in her care, both fatally stabbed. About their mother, returning home with their sibling in tow, who found the above scene. I wonder too about the nanny in question, the suspected murderer, who was loved by the family, who loved the children. The family had visited the nanny’s home in the Dominican Republic and had met her extended family—an experience cheerfully blogged about by the mother. I can only imagine the brutality of learning that someone you thought you knew–someone you trusted with your heart and soul–is the ultimate monster. But something else gives me a great sense of foreboding about the case: the implications for every other nanny in the tri-state area. Going forward, what will life be like for these women? As noted in Saturday’s New York Times, nannies will hereafter be under intense scrutiny. I can only imagine the mistrust, the questions forming that no parent wants to ask, but has to for the safety of their children. This was a family who thought such a thing could never happen to them. Yet it did, which makes it seem like it could happen to anyone. How then, does a good nanny prove she is who she says she is? How can she convince them: that will never be me, I will never lose my mind, I will never put your children at risk. How can she make them believe? For now she can’t. Good women will be doubted. Mothers will hesitate before hiring. When they do hire, they will still be wary, thinking: It was someone else’s Nanny, but it could have been you. Could still be you. Suspician and resentment, and finally guilt–because no one wants to feel these things–will pervade the playgrounds of New York, where both nannies and moms can be found. The aftertaste of this unspeakable tragedy will haunt them for months, years, to come. *Where I live, in Montclair, NJ, I have never heard a mother refer to her kids’ baby-sitter as a nanny. I use the word here because it is the word used in the New York Times describing the case. 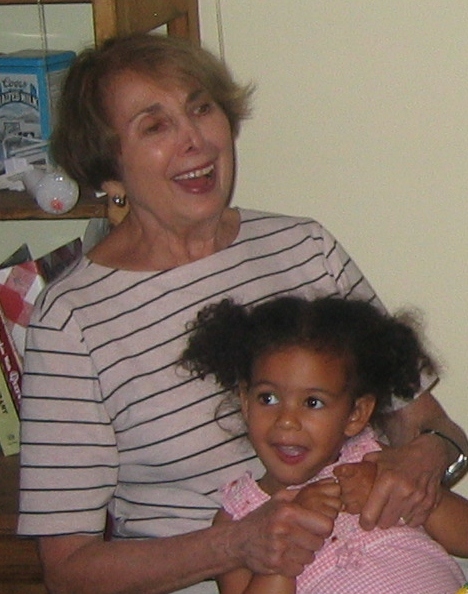 Monique always prefered “babysitter.” Nanny, to her–to us–felt too formal and old school. Just a short post before I go off to the Writer’s Digest Conference—my first writers’ conference ever. I typed up the following (previously scrawled in the margins of a notebook) to distract myself from major anticipatory jitters. I am amazed that my mother still had this photograph of my 5th birthday party. I’m in the red, white and blue flowered dress (I don’t remember being such a shrimp!) Lynn, the girl mentioned below, is the one handing me a present. You can’t see her feet but I believe she’s got on the coveted pink Mary Janes. 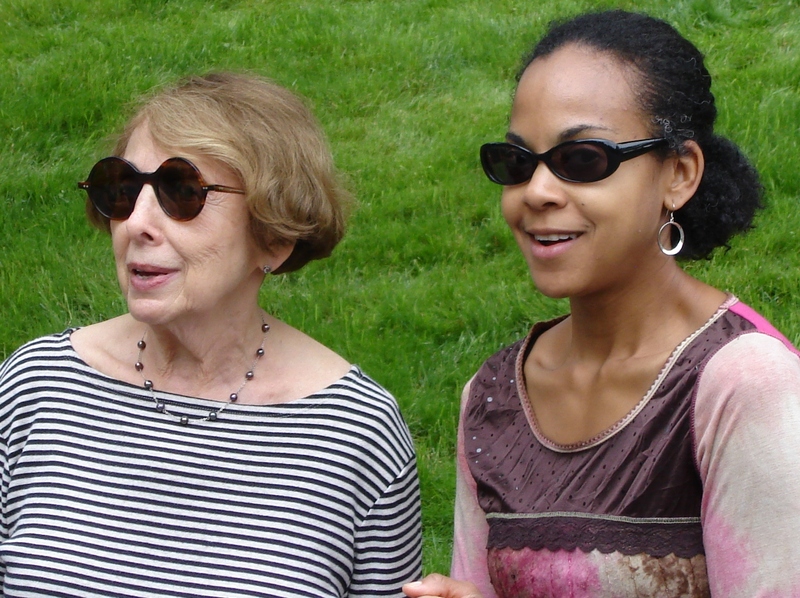 My mother had her purse and some Zabar’s bags draped over one elbow, leaving only one hand free for my friend Lynn and me to share. We were crossing busy 79th Street, heading down Broadway to where she’d parked the car. Between quick-stepping shoppers, Sabrett men pushing carts, and taxicabs swinging around the corner, not holding hands wasn’t an option. Barely hip-level to passers-by, I remember nevertheless catching the eye of a woman a generation older than my mother. She smiled warmly, first at Lynn and then at my mother. Only I noticed the smile; they took it for granted. And, though I was just five, I guessed what the woman was thinking. She saw their matching, straight brown hair and narrow, angled noses. Lynn, to the eyes of the world, was my mother’s child. 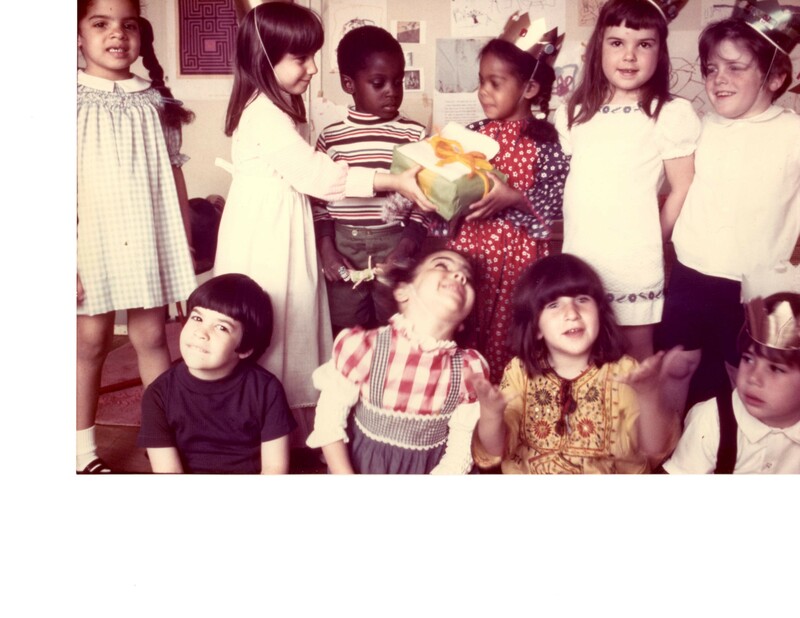 I, the brown girl with wild curls (my mother had no idea how to tame them), was just the friend, the outsider. In any case, I got no smile. I let my gaze drop to the pavement: grey, rubbery, dank and moist. The rain had stopped an hour earlier, but the heaviness remained in the air. The sour smell of a wet, city spring rose to fill my nostrils. The soles of my navy blue Mary Janes made a pleasing slap-slap-slapping sound on the sidewalk, spattering oily drops as I tread. Lynne’s Mary Janes were pink.